There’s already a shortage of spaces, but here, as of late, it seems they are no longer available all day long. It used to be parking was only allowed for two hours at a time during the hours of 9-5 Monday through Friday. Anyone overstaying would have been ticketed. 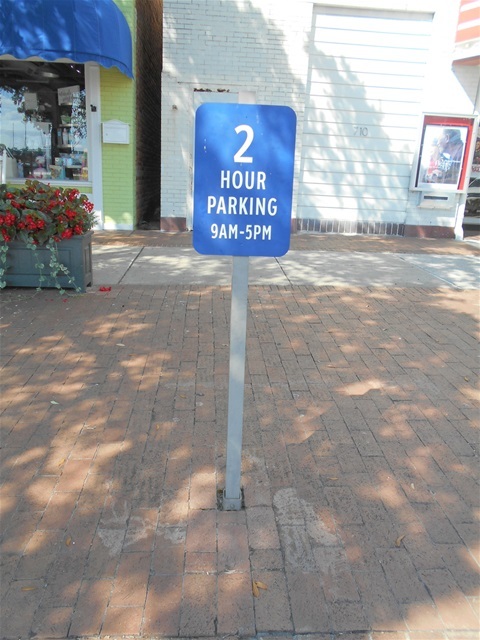 One of Georgetown’s professional photographers, Paige Sawyer, offered up that many of these parking places are filled with employees and business owners whereas in the past, they always parked on the side streets and behind the stores when available, thereby leaving the parking places on Front Street open for customers. It’s been that way every since I can remember. I asked myself what changed? The answer is Officer Ricky Floyd. Officer Floyd patrolled Front Street like it was his own personal space. Many times I would come out of a store after having been inside for only 15 minutes to find my tires marked. I would often shake my head and think to myself that I’d been Floyded. I was told it was none other than my own favorite officer, Shelley Brantley. I laughed and left my number. I was pleased that Shelley called me back within minutes. I opened the topic to him. I could almost see Shelley nodding his head in agreement. “Yes, he did. He was good at it, too, but Officer Floyd didn’t have the dog pound patrol to deal with too. I have to answer calls for them as well. Shelley gave a chuckle, but didn’t offer comment to my suggestion. Instead, he explained, “I will tighten up on them and they’ll get straight for a while and comply then they go back to their old ways again." I pointed out another shop owner who parks in front of his store all the time now. Shelley agreed, he has seen him, too, and has asked him several times not to do that. We talked about the fines for their total disregard to the Front Street parking rule. After I wrote a page of notes, I asked about the second part of Jack Woodward’s question: the handicapped and accessible parking spaces and was told I had to address city council for that. I had already suspected that answer and so I put in a call to the Mayor, Brenden Barber, who is also the head of City Council. As of yet, I have not heard back from him. He’s been at the high school with the children doing a training camp. Hopefully, he will get back to me at some point soon. I also put in a call to a couple of City Councilmen. Councilman Al Joseph called me back within the hour. I explained the situation to him about parking places and the lack of handicapped spaces, as well as the lack of ramp or wheelchair accessibility. With that said, I asked about the next council meeting. I’m thinking I need to attend and follow up on this. I’ll do my best to make that meeting which is due this week. If nothing else, we have Officer Shelley Brantley taking care of business along the main street in Georgetown. If not for the community, then for the tourist that would like to stop and shop along our historic district. If they can’t stop, they can’t shop.